Hikari Cichlid Gold Mini Pellet Floating Food contains special color enhancers designed to bring out the natural beauty and proper form of cichlids and other larger tropical fish. 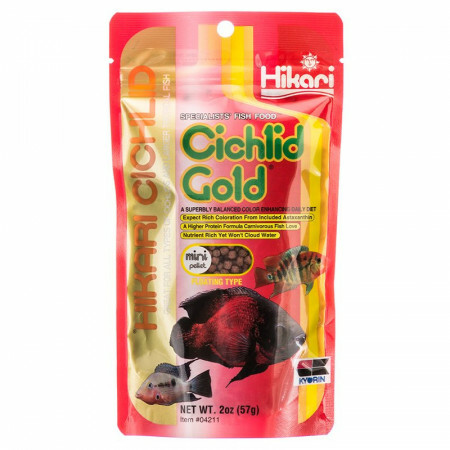 We utilize the highest grade of ingredients formulated in exacting quantities to produce a food that will bring the brilliant colors of your fish to life! Floating pellets will not cloud water, and reduces water quality problems. 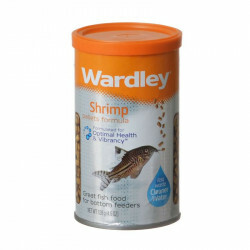 Allows easy monitoring of amount eaten, helping to eliminate over-feeding. 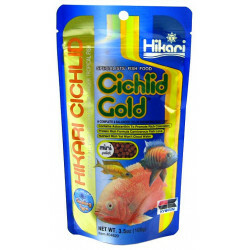 This Cichlid food is high in Carotene & NS Germ, bringing out natural, brilliant colors and reducing washed out colors. Helps to promotes resistance to stress and infectious disease, and promotes a long, healthy life as well as improved growth rates. 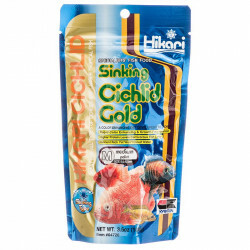 The product is great for larger tropical fish as well. 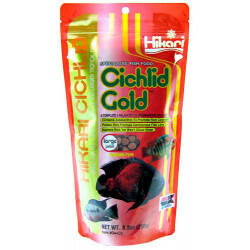 Ingredients: White Fish Meal, Wheat Flour, Wheat Germ Meal, Brewers Dried Yeast, Soybean Meal, Shrimp Meal, Dehydrated Alfalfa Meal, Carotene, Thiamine Mononitrate, Riboflavin, Pyridoxine Hydrochloride, Vitamin A Supplement, L-Ascorbyl-2-Polyphosphate, Vitamin B12 Supplement, Biotin, Calcium Pantothenate, Choline Chloride, D-activated Animal Sterol, Folic Acid, Menadione Zinc Oxide, Manganous Oxide, Salt, Ferrous Chloride, Copper Sulfate, Cobalt Sulfate, Aluminum Sulfate, Magnesium Sulfate.